A long day: We have to get up at 2 am in order to go to Stuttgart by car and take our flight to Amsterdam, leaving 6:30. After 2 1/2 hours we continue to Lima, where we arrive at 4:15 pm local time. At six we finally arrive at the hotel which we had booked in advance. The time difference to home is seven hours, so at home it would be one o'clock at night now. One of our first strange impressions of Peru is that about 95% of all cars are just one model: Toyota Corolla Combi in white. This is not a bad car, I also have one in Germany (but in red color), but such a conformity is somewhat strange. The reason is that during the times of president Fujimori (who is of Japanese origin) the import of these cars was facitilitated. We have the whole day to get an impression of Lima. The hotel is situated in Miraflores, the "new" center of Lima where there is the biggest choice of hotels and restaurants. One also finds swanky casinos and other unnecessary things; the price level of the whole area is ckearly oriented to foreign tourists. The beach is situated at the base of a hundred meter high steep coast; along the road on top as well as down near the beach we see many joggers. At the sea, a fishing competition is taking place: everywhere people with a number on their backs are sitting, fishing rod and a small bucket in their hands. The weather is dully and grey, for Lima the usual foggy situation. In November the sun would come back, and then also the locals would bath in the sea. At the moment, we see only surfers in neoprene clothing in the water. A stone heap in the city turns out to be the open-air museum Huaca Pucllana: a pyramid building of the Lima culture (200-700 A.D.) made of adobe bricks; however it was revuilt and overbuilt by several other cultures before the Incas; therefore nowadays there is hardly a pyramid identifiable. In the "old" center in the north one (of course) finds the Plaza de Armas in an environment which was almost completely restored in colonial style. The big wooden balconies of the houses around the Plaza are beautiful. As we meanwhile found out which line to take, we dare 9 kilometers of the hellish trip in a Lima colectivo, back to Miraflores. By taxi it would have been more expensive, but just the same kind of driving style. At 10 p.m. the bus to Huaraz departs from the bus terminal. Everything goes well, we had booked the seats in advance in the internet. The security measures seem a little exaggerated: Security personnel with metal detector inspects the hand baggage when entering the bus, and later a guy with a video camera documents which passenger is sitting on which seat. The road had been bumpy for quite a part, so we couldn't sleep very well (what anyway would have been possible not before 12:30 after the unavoidable movie was over. At least there were English subtitles and the movie was not as violent as we know from Chilean buses). Huaraz at 5:30, it is still pitch dark. At the bus terminal some guys distribute brochures to the arriving passengers. Before spending a lot of time looking for an accomodation we simply choose one of these offers; it is quite a bit away from the center but finally turned out to be a good choice. In the National Park office, our wish to climb some mountains without mountain guide is received not very friendly: "Necessitan guía" is the first sentence we get to hear. As we present our alpine club card, we are "deportista" (sports[wo]man), and then finally we can do what we want. With rented bicycles we explore the slopes of Cordillera Negra a little, but soon rain sets in which is not a pleasure on the sandy roads. Still raining, San Juan is to blame. People say that this holiday would be rainy every year, but soon after it would become nice and sunny. We will see. At Plaza de Armas a ceremony with flag, hymn, and deployment of schoolchildren and working people takes place. 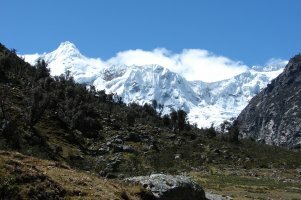 In the afternoon the weather is improving; we go on a bicycle trip towards Cordillera Blanca to the entrances of the valleys Quebradas Llaca and Cojup, up to 3850 m altitude. (Huaraz is at 3100 m.) The roads are partly good, partly rather bad. The steep canyon-like entrances of the valley are very impressive to see. We have a taxi transport to Quebrada Llaca to begin the climb of our first mountain here, Vallunaraju. After leaving the road of yesterday's bike trip, the road becomes terrible; despite or even because of that, 20 Soles of road use fee are collected at the valley entrance. The road ends at Laguna Llaca (4480 m). The narrow valley offers hardly any way to reach the slopes above the steep rock walls. Therefore the trail towards Vallunaraju begins with an extremely steep section, wet and slippery due to the bad weather of the last days (it is on the south side which is the shady orientation here). We work our way upwards through the mud; one wet rock slab offers neither steps nor holds, so we have to use the rope already here. Fortunately this was the crux. Further above, the slopes are less steep. Close to the last vegetation at 4950 m there are a couple of nice campsites, there is plenty of water from the melting snow above. 3 1/2 hours for 500 meters ascent, this should be a reasonable speed for the first day at the altitude. The route to the glacier consists of rock slabs interrupted by miniature canyons. We investigate the way in the afternoon. Shortly after we are back at the tent, rain sets in, and in the evening the rain becomes more and more intense. Around eight o'clock yesterday evening the rain had stopped. In the morning, here and there the trail is icy, but fortunately the rock - especially the steep slabs leading to the glacier - are dry. 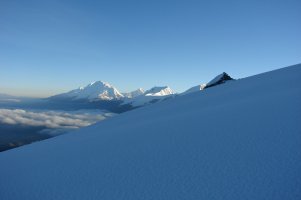 The glacier begins at 5020 m; we follow a trace made yesterday, but it ends at 5300 m. Now we have daylight, but in the shadow still it feels very cold. Our progress is not very dynamic, since we have to break the trail. The area is crisscrossed by many crevasses, but the route is rather obvious. 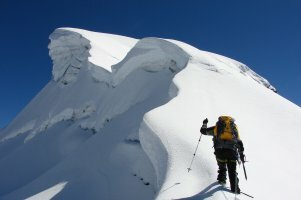 We soon learn that steep shady slopes are not a good shortcut: In slopes without sun the snow remains deep powder. 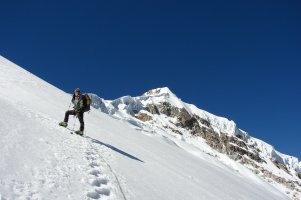 At 45° steepness we stand waist-high in the snow, getting ahead not a single meter despite digging with hands and feet. So we try further to the right, and there the snow is completely different. Only short powder basins, which can be overcome with a little work; the rest is more or less solid. 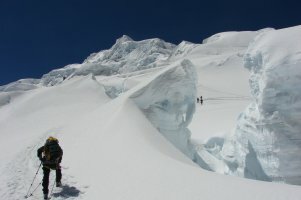 At ten o'clock we reach the saddle (5595 m) between main and secondary summit. 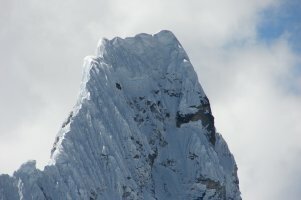 The summit crest has no not serious difficulties, fourty minutes later we are on the summit (5686 m). Impressive view, especially towards our wild neighbours Ocshapalca and Ranrapalca. Around noon it is very hot on the glacier, we need all beverages that we took with us. Fortunately the descent is quick: two hours to the campsite, another 90 minutes to the road. The steep trail still needs some caution; we rappel at the short slab. The driver picks us up in time, so we are back in Huaraz in the evening for lomo, papas fritas and cerveza. Rest day in Huaraz; we take a taxi to the termas de Monterrey. The color of the thermal water is a little unusual, but it is nicely warm. 1 1/2 hours drive from Huarz, we load our heavy baggage, which we need for the next four days, onto two donkeys. So we ourselves have to carry only a small handbaggage. 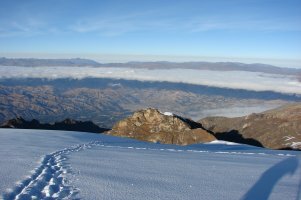 From Cochapampa above the village Pashpa (3600 m), the way to the base camp in Quebrada Ishinca (4400 m) takes about four hours. A major part of the trail leads through a nice bush forest. Unlike the access to Vallunaraju, it is very easy. Otherwise it could not be used by donkeys. The campsite is a big meadow at the end of the valley, directly beyond the last trees. For the rest of the days we install ourselves in the camp. A somewhat lengthy but obvious trail leads up into the side valley of Laguna Ishinca. 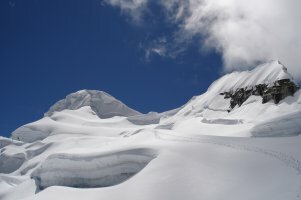 Perfect weather, it soon becomes warm on the glacier. 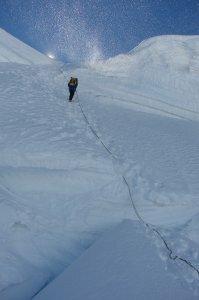 The short headwall under the summit is no problem, 45° steep with good steps. 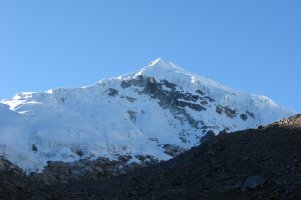 Nevado Ishinca (5530 m) is situated in the middle between its big neighbours Ranrapalca (6162) and Palcaraju (6110, 6274). 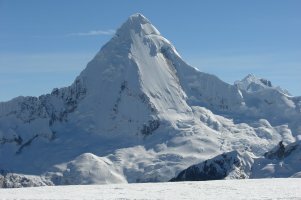 So there is a good view to these two, but around them we see a many other snow peaks with sometimes very venturous cornice constructions. In the early afternoon we are back at base camp, a good time to sort things, dry clothes and eat. At six the sun goes down, and at half past six it is pitch dark. Sunrise will then be at half past six in the morning, so the nights here are always more or less twelve hours long. Again we leave around sunrise. The trail to Urus climbs very steeply up a south slope, but since it follows a moraine ridge we get some sunshine already after one hour. Further up we follow snowfields and some rocks; the glacier is completely harmless, we can go without rope and only with skipoles. The 45° steepness mentioned in the guidebook don't occur. So, Urus Este is comparably easy but not boring, because progress is fast on the steep trail. 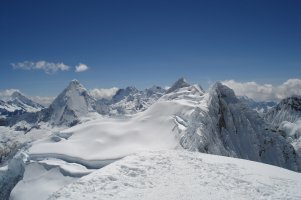 Four hours for the 1050 height meters to the summit, a comprehensive view around. 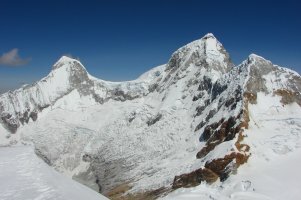 Although it has the subtitle "Este", this summit is quite independent as well as the other two Urus (Central and Oeste). Towards Urus Central one would have to descend 200 meters first, and the three mountains have completely different ascent routes. Back to base camp at 12:30. We can purchase beverages at reasonable prices at the sales booths of the local people. It wouldn't have been necessary to transport so much on our donkey. For the next time we'll know what is available. At four o'clock the site becomes shady, sunset as usual at six. For the moment our acclimatization trips are finished. We don't have Tocllaraju on our schedule now, because it offers some technical difficulties high above. Therefore we ordered an arriero with donkey for this morning in order to walk back to civilisation. The morning is cold, everything is white from frost. Our arriero comes at eight, we load the donkey in the cold. Fortunately soon the sun is coming; after 2 3/4 hours we are back to Cochapampa. Because the donkey was not fully loaded, we allowed another group to put their baggage on, too. In the end, the arriero takes the full normal fee from each of the groups - not only for one donkey but also for one arriero. As if he had had twice the work! A rest day again, we have to refill the food supplies and organise the following days. We book the bus trip back to Lima in two weeks and get the food for the next tour. In Huaraz we see another parade, this time it seems to be a school sports event. 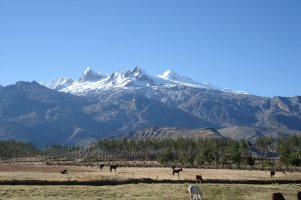 We arrange the next trip for a duration of five days - we heard that from Tuesday on there might be problems getting back to Huaraz because of a protest campaign against high food prices. 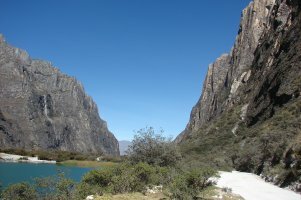 We have a taxi ride northwards to Quebrada Llanganuco which has two very nice lakes. At the bend at 4200 m we begin the ascent to Chopicalqui; since we have some more food supplies for another tour to Pisco we soon deposit part of the baggage and "only" take the food for the next four days with us. Chopicalqui base camp is only one hour from the road; it is just around noon, so we go on to moraine camp following a long moraine ridge, in parts covered with lupin bushes. The way is not as direct as it looked at first glance: many small ups and downs on the moraine ridge, and the traverse from the right to the left border moraine offers a long counterslope (of course in loose scree and blocks, where in former times there might have been a glacier). Towards the end the ascent is very strenuous because the guidebook gave an altitude 200 meters too low for the camp. After six hours we made it through the 800 height meters, the moraine camp is at 4990 m altitude. 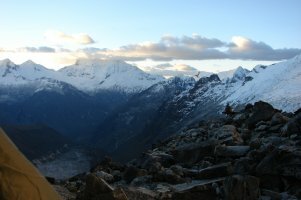 In the morning, after the sun had reached the camp, we stumble through loose scree with our heavy packs. Eventually we can go up on the glacier which is - unexpectedly - easy to follow due to good snow bridges over the crevasses. 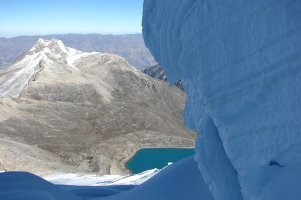 At 5500 m there is the last good camp site with a reasonable amount of space; further up the "sites" are too aslope. We meet three Germans from Saxonia just below the campsite; they had made the summit today starting from the moraine camp - this appears to be not the best choice, obviously the way was very far. We leave the camp at 5 a.m., but we don't get very far. My feet and hands don't become warm during the walk2, I feel colder and colder. Nothing helps, we go back to the tent. Second attempt at 7 a.m., meanwhile I warmed up again in the sleeping bag. Now there is daylight, this also has a good effect on the moral. After a steep step of 300 height meters we reach the sun, but now my stomach begins a revolt. Somehow we shall not succeed today. It's a pity, conditions would really be good, everywhere good and well consolidated snow. 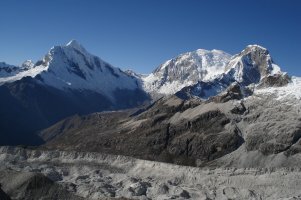 We go down again, to the glacier camp, to the moraine camp, to the base camp, to the road. The way is very lengthy, it is hot and we don't have enough water with us. 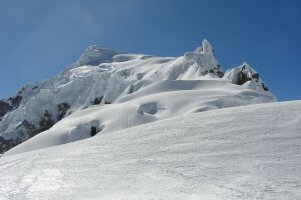 The counterslope at the traverse of the former glacier is a torture. Finally we reach our deposit containing the beverages; at 2 p.m. we reach the road again. 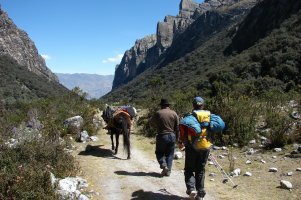 If we could arrange a transport to the Nevado Pisco trailhead in four kilometers distance, we could go to Pisco tomorrow and the day after tomorrow, and we would be back in the valley before the road blockades. Indeed after half an hour a taxi appears which brings us to the bend at Cebollapampa. 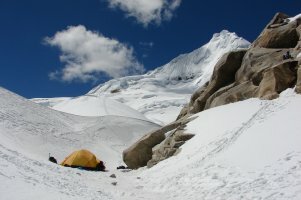 From there it takes ten minutes to the valley floor where a nice campground is situated (Cebollapampa, 3900m). The most important about it: There is a beverage sales booth. We can rehydrate without falling back on the supplies which we brought with us. 2This is strange because the temperature is not too low (-11°C). Maybe it is an effect of the diarrhea which I don't get rid of since several days. No more heavy-load ascent! 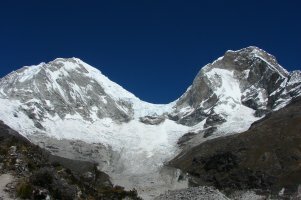 Today we will go up to Pisco base camp, but because there is a hut we will not take the tent with us. The altitude gain is only 700 meters, but the ascent seems endless. Probably because of yesterday's extertion. After about four hours we reach Refugio Perú at 4680 m. It looks quite similar to a Swiss SAC hut (including cake for sale on the counter). The price for an overnight stay is quite high for Peruvian price level (12 US$), in comparison to Ecuador this still is rather cheap. Unlike the huts in Ecuador there are also meals available here. We start at 4:45 in the morning. After a first steep slope and half an hour, we stand on top of the moraine of the former glacier which cuts the valley in east-west direction. The only remains of the glacier is a huge scree field, so we have to descend about 80 meters using an adventurous trail in fine sand. There we find the way on through the glacier basin and finally climb up the other side towards moraine camp and towards "our" glacier. 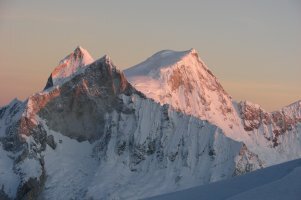 Meanwhile the sun is rising, it is not very cold on the glacier. From here on we can follow an obvious trace, so one definitely can't get lost. 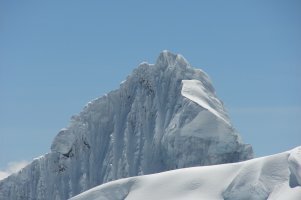 The route follows the west ridge, respectively the glacier covering the NW slopes. Until just below the summit there is no difficulty, but it is interesting to see how each of those abysmal crevasses that completely cut the glacier into pieces are spanned by exactly one snow bridge each (which is used for the route, of course). The last 20 meters to the summit are a little steeper (40-50°), but thanks to good conditions no special belay is needed. At 11:45 we are on the top. The view is magnificient, although already some clouds have come up. 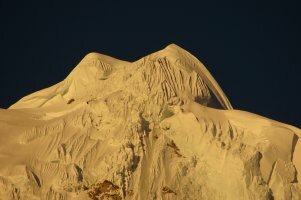 In particular the very wild Chacraraju is very impressive; Alpamayo looks rather unimpressive from this distance, and also the "Paramount mountain" Artesonraju is a nice but not too spectacular pyramid. 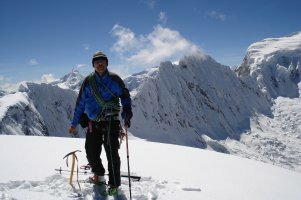 There are quite a lot of people at Pisco; many are completely over-equipped for the current conditions: two ice axes, many aluminum profiles and of course a helmet. Neither at Pisco nor at Urus or Ishinca there would be any more than the sky itself that could fall upon one's head. Why do all these people wear a helmet? 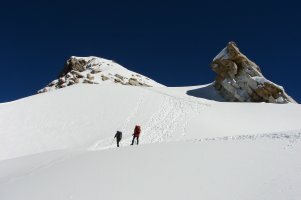 The descent over the glacier is quickly done, only the traverse of the former glacier is lenghty because of the scree. At the refugio we take our stuff and walk down to Cebollapampa in about an hour, there take our tent and the equipment which we had deposited there (including the helmets;-) and walk up to the parking lot. By chance, indeed there is a taxi. It can bring us to Yungay for 100 Soles, but unfortunately not to Huaraz. The protests already have begun, road blockades would already be installed. Apparently no car has come further than 7 kilometers towards Huaraz from Yungay. So we have to look for accomodation in Yungay. Being "blockade victims", all our clean clothes and the comfortable shoes are in Huaraz. We only have what we took with us the last five days, including the heavy mountaineering boots. At first glance - being focused on foraging - Yungay appears as a small village compared to Huaraz. The "center" seems to be crossed within five minutes, and restaurants with a choice of more than one dish seem not to exist. That's gonna be a fun, we have at least two days to spend in the village - there are no other options due to the complete lack of mobility. Even for a small village as Yungay seems to be, the morning is very quiet: general strike. Almost everything is closed, no cars in the streets, no noise. We sleep away the day, nothing else to do in the dozy village. Finally in the evening we find another restaurant which offers not only pollo. Tomorrow the strike is expected to peak out, for sure there will hardly be anything to buy. The situation is similar to yesterday, except for some small grocieries (at least!) everything is closed. No cars, everything is very quiet. We leave the hotel for a visit of the old town of Yungay. This was destroyed on 31 May 1970 by an avalanche of ice, mud and scree which had been released at Huascarán Norte by an earthquake. Almost all 20000 inhabitants were killed; the town was rebuilt 2 km further to the north, while the area of the old town, destroyed and covered by 10 meters of scree, since then is a memorial place. Standing there looking at Huascarán, one can hardly imagine such a violence over 12 kilometers distance. We can sleep away the rest of the day without missing anything. This is also good for our (once again...) diarrhea. In the evening the situation begins to normalize again, the blockades apparently are canceled. We wait until tomorrow morning to return to Huaraz, one night won't matter - and the first rush demand for buses will have settled until then. 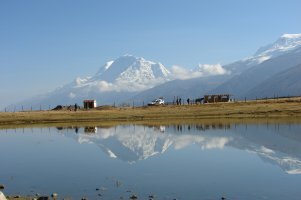 In the morning we go to Huaraz by colectivo, which is a lot cheaper than a taxi but of course it is less comfortable and takes a longer time. Since the day before yesterday the weather has changed: In particular in the mountains there are lots of clouds, and above the highest mountains ragged clouds indicate strong winds. We probably haven't missed very much in the mountains these days. The three rest days were worth it, the diarrhea is gone. We start making plans for the remaining week. 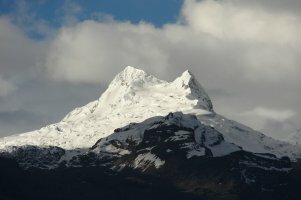 We could attempt Huascarán, Perú's highest mountain. This would be an issue of 5-6 days needing all the effort of porters, mules, cook etc - since for the moment we don't trust our fitness to carry all the equipment for two high camps. 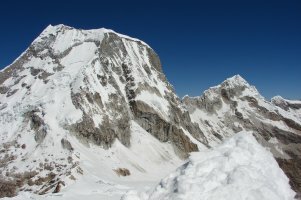 The other option would be Tocllaraju in order to climb at least one 6000m summit. 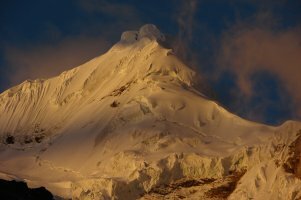 Although we had already been in Quebrada Ishinca, we had not attempted Tocllaraju because we didn't want to make a high camp in that early phase of acclimatization. The second agency where we ask for the costs of Huascarán has the interesting idea to first have a look at the weather forecast for the next days. It looks a little unstable, Huascarán therefore is out of the question. Another rest day. There seem to be quite a discrepancy between weather forecast (according to the internet) and the reality. For today good weather was announced, in fact only the morning was partly sunny, and in the afternoon there is heavy rain. In any case our decision against the very big mountain seems to make sense. Again we go to Pashpa and hike up the Quebrada Ishinca. The official at the national park control post argues that besides our alpine club cards we would need a special letter from the main park authority in order to be accepted as "deportista". Why should they not have said that at the administration office - we have the tickets from there? And, two weeks ago the same control post didn't mention any letter. Finally we can enter without the ominous letter. In the afternoon, after arrival in base camp, we go for a transport towards high camp two hours higher (4880 m), so we won't have to carry that much tomorrow. The weather is not as perfect as two weeks ago, but still mostly sunny. The weather looks strange this morning. Not really bad, but - just to make a decision as hard as possible - only unusually compact cloudes from the east, from behind the mountains. In the course of the morning, however, they slowly dissolve. 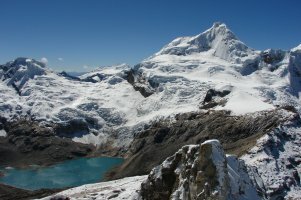 We move to the high camp at Tocllaraju. 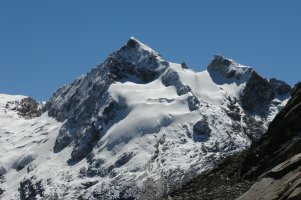 It is situated at the edge of the glacier at 5160 m. One could also camp further up on the glacier, but we cope with this stage. At 4:15 the night is over. Sorting the stuff and putting on the clothes takes almost an hour. Although it is not really cold outside (-10°C), feet and hands again don't want to become warm. In addition we have an annoying wind that quickly makes the trace disappear under drifting snow. The west slope remains shady a long time, and offers quite some entertainment: a 55° steep section in the snow, a very inviting deep crevasse (its edge shouldn't be damaged, else nobody could traverse it any more), and a 50° steep slope in ice and snow along a crevasse. After that, the slopes open up and we reach the northwest ridge - and finally the sun reaches us. Our progress is not very quick, mainly caused by my cough and the meanwhile fierce winds. 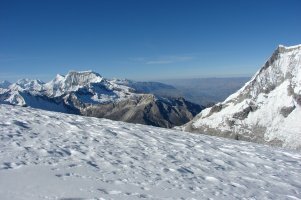 At about 5800 m we turn back, it would habe been another 150 meters of easy terrain to the beginning of the main difficulties at the summit. So we are back in base camp in the afternoon. After the reasonable weather during the day, the evening offers an extensive sleet shower. We have a lot of time, as we haven't organized for donkeys for the way back. So we get up as late as the sun hits our tent. As the first donkey drivers reach the camp, we look around for a transport back and soon find a mule. The mule goes to Collon which is at lower altitude than Pashpa, but for the descent that doesn't matter. Collon is about as developed as Pashpa, at noon there is nothing going on here. The arriero goes to get a taxi, and during half an hour we are the main attraction for all children from anywhere. 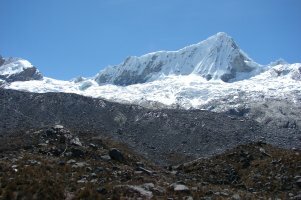 In the afternoon we are back in Huaraz. In the evening there is a nice rainbow, but rain comes down only in the mountains east and northeas of the town. We had been looking forward to visit the rare Puya Raimondi which grows in only two valley in the south of Cordillera Blance. But the ski resort Pastoruri is closed, so there are no buses to the region, therefore we cannot go there with a reasonable effort. So we have a short hike to the view point Mirador de Rataquena above the town. For diner we try cuy: tastes a little like chicken, but not as much meat as chicken would offer. Not really worthwile. We go back to Lima during the day, so we can watch the landscape. And, we can watch landscape for a more than two hours, in the desert 200 kilometers before Lima, until the spare tire is mounted. This is already the second tire problem. Therefore we arrive in Lima at 7 pm instead of 4:30 and can fully enjoy the evening traffic jam. In Miraflores there is a "Fiesta de la Peruanidad". Whatever this may be, the streets are closed for cars and everything is a pedestrian zone this evening. A little bit of sightseeing: center of Lima and inquisition museum. In the old city there is a big and loud costume procession, at the plaza a snappy police parade. The flight back takes a long time, we have to "give back" the 7 hours time difference. So we leave Lima in the evening and arrive in Stuttgart in the evening of the following day.